Henley Honda | Vehicle Features | When should you replace your tires? Tires are one of the hardest working parts of your Honda vehicle. They’re constantly moving, keep you on the road and help ensure you have a smooth ride. When they start to wear down, you can face serious trouble, from reduced traction, longer stop distances, and rougher rides that will reduce your safety on the road. So, how do you know when it’s time to replace your tires? The depth of tread left on the tire will help determine the amount of life you have left on it. The purpose of the tread is to divert water from beneath the tire to improve traction and avoid hydroplaning. As the tread gets shallower, the tires offer less traction and reduce the safety of your car. In general, tread that is below 1/16th of an inch deep (1.6mm) should be replaced, though many people choose to do so sooner, especially when driving in adverse weather conditions. All new tires sold in Canada come equipped with tread wear bars, which are small raised bars of rubber in the grooves of your tires’ tread. Looking at the tread pattern, you can see them between the tread blocks. As the tire wears, these bars become flush with tread, meaning it’s time to replace them. You can also measure the depth of tread by using a tread depth gauge; a special tool that will allow you to accurately measure the depth. These can be obtained at any auto parts dealer and are easy to use. 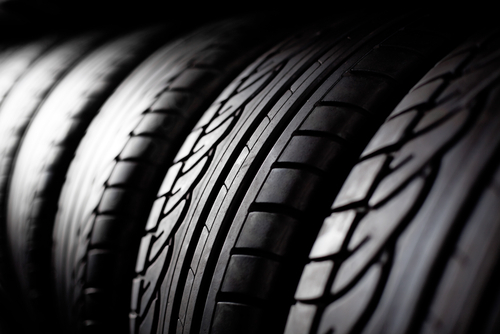 Tires should also be checked at least once a month for signs of advanced wear on the inner or outer edge of the tire. There is also a chance you won’t visually notice wear on your tire. If you feel vibration, hear irregular noise or find that the car is pulling unusually to one side, it could be a sign that your tires need to be replaced. If you notice any of these signs, bring it in to the service shop to have a certified technician take a look. Of course, tire inspections are included in your multi-point vehicle inspection performed each time you bring your Honda in. If it comes time to replace the rubber, Henley Honda can help you out! We offer the Honda Tire Source Lowest Price Guarantee on a wide range of brands and you can be assured we will fit the right tires to your vehicle. Don’t take chances with your vehicle’s safety; inspect your tires regularly and replace them before it’s too late!